In 1991, Street Fighter II was released in the arcades to great acclaim. Ports of the game to home consoles and computers and clones like Mortal Kombat soon followed. Virtually any property or idea could be used in a fighting game, including dinosaurs (Primal Rage), The Simpsons, or even Nintendo's characters (Super Smash Bros.). 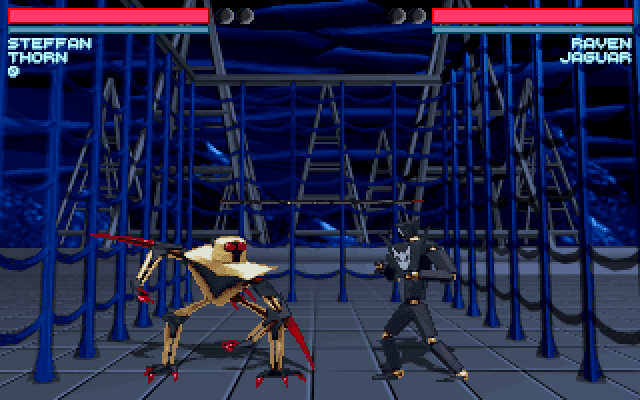 In 1994, two different companies released a robot fighting game for the IBM PC Compatible platform. 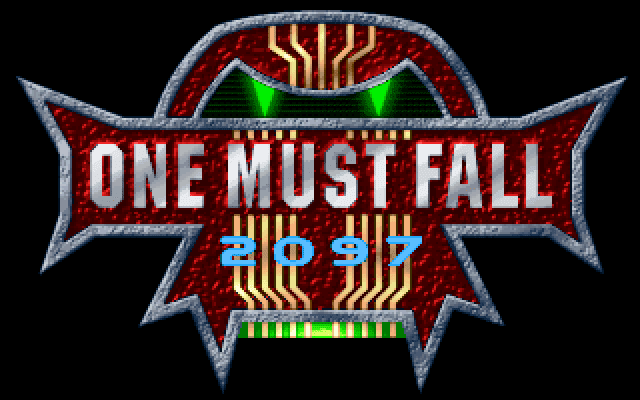 The first was One Must Fall 2097 (OMF), developed by Diversions Entertainment and released around October, 1994 by Epic Megagames. 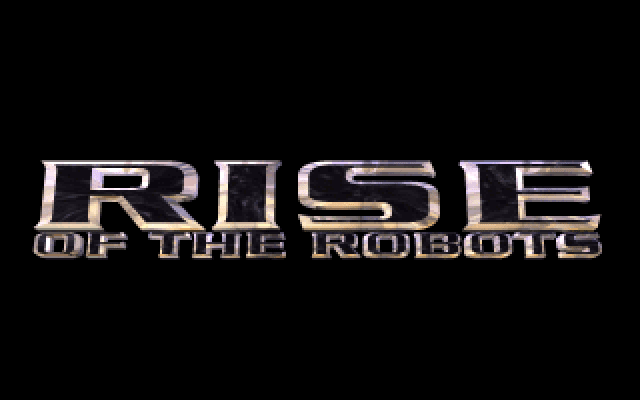 The second was Rise of the Robots (RotR), developed by Mirage Studios also released around the same time by Time-Warner Interactive. In this article, we will compare these two DOS fighting games in every area. As you will soon read, this comparison will turn out to be grossly unfair to one game. OMF uses the standard 320x200x256 VGA color mode and originally came on five floppy disks. Later releases were on CD. RotR was released in separate 320x200x256 VGA and 640x400 SVGA boxes. The SVGA retail version took up fourteen disks. The VGA version, which was released only in Europe, still took up ten, The VGA version has more animated cutscenes than the SVGA version. RotR was also released on CD with more animated scenes than either disk version, but no extra gameplay or music. 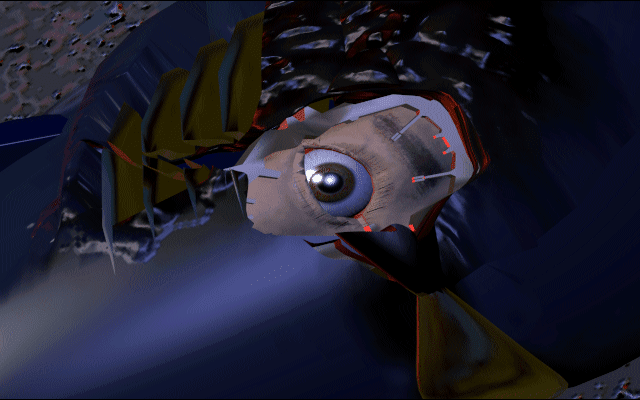 The screenshots for OMF and RotR VGA in this post have been pixel-doubled to 640x400 while the screenshots from RotR SVGA are in their native 640x400 resolution. 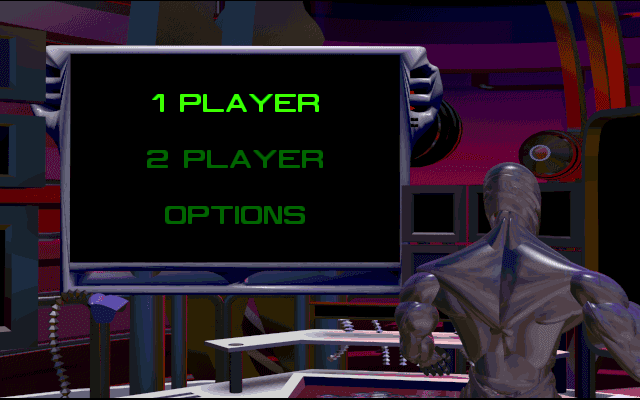 Neither game featured scrolling backgrounds. 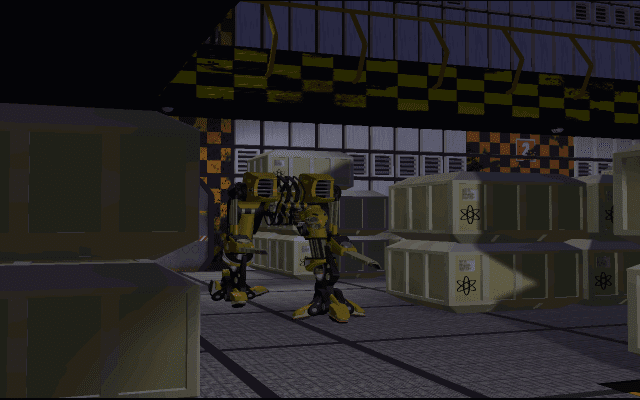 Unlike RotR's static backgrounds, there is animation in OMF's backgrounds and hazards (spikes, fireballs, electrified walls, strafing aircraft) that can harm either opponent. OMF takes its inspiration from Japanese anime. Realism is not particularly prized. This approach was uncommon during the mid-90s, when DOS games were generally striving for better realism. 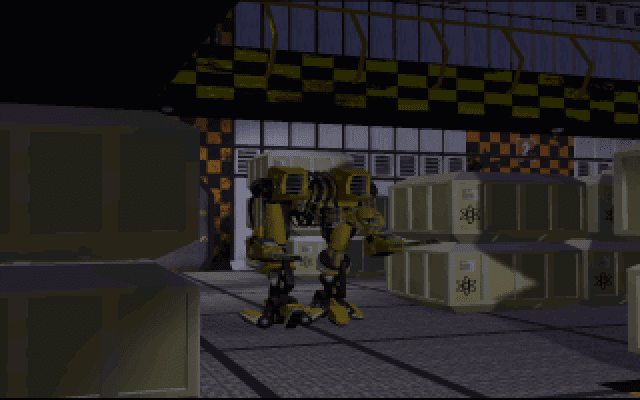 RotR shows a more Western sci-fi influence, where realistic shapes and models are used. Robot animation seems a bit choppier with RotR than with OMF. Both games run very well on a mid-range 486, even RotR in its SVGA version. Both games have entirely digitized sound tracks. OMF officially supports the Sound Blaster, Sound Blaster Pro, Sound Blaster 16, Pro Audio Spectrum cards and the Gravis Ultrasound with 512K or more of RAM. The Ultrasound is the best choice by far for the game, the audio output quality with this card is always at its best. The Sound Blaster 16 and the Pro Audio Spectrum 16 require a Pentium sound quality approaching that of the Ultrasound. Even at the maximum quality settings, the music and sound effects as output by a Sound Blaster 16 or Pro Audio Spectrum 16 still sound a bit muffled and noisy compared to the output of the Ultrasound. RotR only officially supports Sound Blaster cards. It does not allow the user to determine the type of card, original, Pro, 16, in the setup program. The music for OMF was done by C.C. Catch (real name Kenny Chou) of the demoscene group Renaissance. It is well-known that the demoscene took to the Gravis Ultrasound and thrived with it, and this music is well-representative of the music found in demos. Each of the five arenas has its own music. The "music" for RotR was done by Brian May, the guitarist of the band Queen, however in the DOS versions it consists of 15 seconds of guitar riffs, even with the CD version. May's music is only heard during the title sequence. The rest is ambient audio, even in the fight scenes. The 3DO version has his soundtrack in addition to the Mirage soundtrack. Both games support the use of the keyboard or joystick. Gravis gamepads, which are digital, are highly recommended. Only the first two buttons on a joystick are supported. Gemini of Ancient DOS Games indicates a preference for the keyboard because it is easier to pull off special moves. Both games use the Up, Up-Left and Up-Right joystick positions to jump. OMF uses one button for "punching" and one button for "kicking". RotR uses one button for attacking and one button for blocking. In both games blocking can be done by holding the directional away from the attacker. In RotR, blocking an attack will still result in damage being taken, OMF only allows special attacks to take away health if successfully blocked. RotR requires you to hold down the button to determine the strength of the attack, then push a direction to initiate an attack. This is very strange for a fighting game. Ordinary fighting games give an instant response to a button push. If you press the punch button, your fighter punches. The strength of the attack is usually determined by the button pressed. In RotR, if you want to make an attack any more powerful, you must hold down the button until the power meter is at the level sought, then release the button to make the attack. Needless to say this scheme throws timing completely off and makes jump attacks much more difficult to pull off than they should be. OMF has a much more fluid control scheme like Street Fighter II. It uses the combination of direction with the punch and kick buttons to determine the type and strength of the attack. The push of a button, even without a direction, will still result in an attack. Another oddity for RotR is that you cannot jump over your opponent and will always face the same direction. 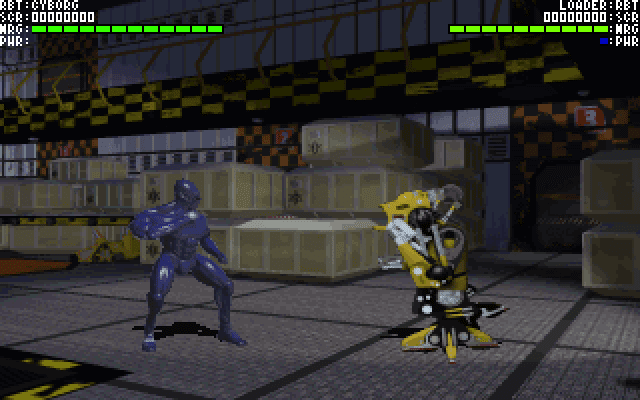 With a special move list, I was able to perform special moves for the Jaguar robot reasonably well with OMF, but could not execute the special moves for RotR's Cyborg at all. 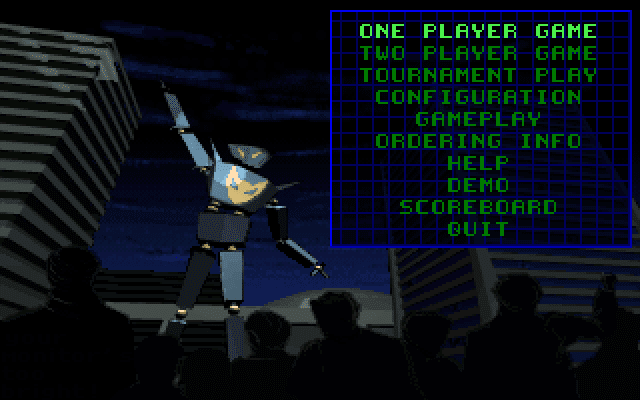 OMF in its one or two player games requires you to select a pilot for each robot, and there are ten pilots, each with their own back story and motivations. The pilot determine the strength, speed and endurance of the robot selected. When pilots fight against each other they taunt each other before the fight, and each pilot has his or her own ending. There are ten robots ordinarily available, each with their own handling characteristics and three to four special moves. Thus 100 combinations are available. There are also special finishing moves like the fatalities of Mortal Kombat. In the Tournament Play, you get to customize your own pilot character and your robot. You can earn money by victories to buy upgrades for both and can eventually purchase new robots. This is as about as close to a Role Playing Game as a fighting game got at this time. 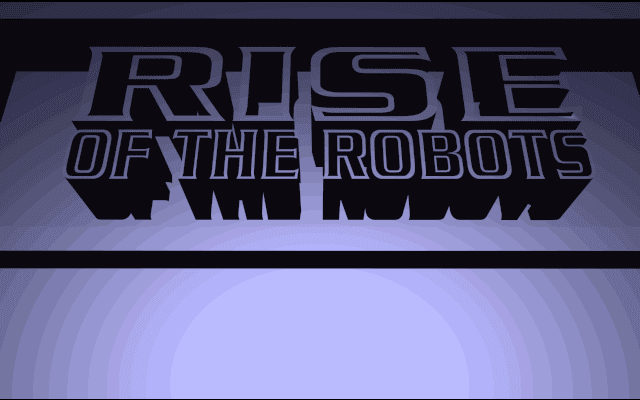 RotR has one main robot, the Cyborg which you can use in the story mode. Five more robots are available for practice and in the two player fighting mode, but one player must control the Cyborg. Each robot has one or two special moves. 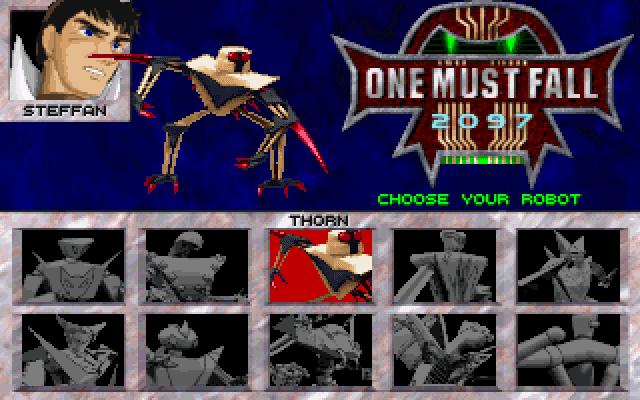 OMF was strictly a DOS game. RotR was released for a wide variety of platforms, including the IBM PC Compatibles, the 3DO, Commodore Amiga (separate 32-color and 256-color disk releases), Amiga CD32, Phillips CD-i, Sega Game Gear, Sega Genesis and Super Nintendo. The Super Nintendo version has more animation and music than the PC floppy versions, although it weighs in at only 4MB compared to the 29.7MB install of the SVGA PC floppy version. OMF has many difficulty levels, some of which are hidden. The readily available difficulty levels are punching bag, rookie, veteran, world class and champion. There are also the hidden difficulty settings of deadly and ultimate. The lowest difficulty is for practicing moves, and the rookie difficulty is manageable once you know the regular and basic special moves. The higher difficulty levels above veteran require real commitment to the game. I was able to win on the veteran difficulty level (the lowest level of difficulty where you can face the final pilot and win the game) after a few hours of playing the game with the basic Jaguar robot. RotR has beginner, easy, medium and hard difficulties. Don't be fooled, the beginner level is very difficult. The true final robot is only accessible after beating the hard difficulty twice. The robots you will face in the game have tremendously unfair advantages. Almost all of them seem to move faster and have attacks with a much better reach than the Cyborg and more powerful to boot. They do not seem to be hampered by the control scheme inflicted on the player. OMF supports remote multiplayer as of version 2.0 through a null-modem serial link, a modem or over an IPX network. It also will let you record your gameplay and play it back later. There are a number of secrets, codes, robots and settings. There is a hyper mode that makes for faster gameplay and more intense special moves. RotR has a few special codes, but generally what you see is what you get. 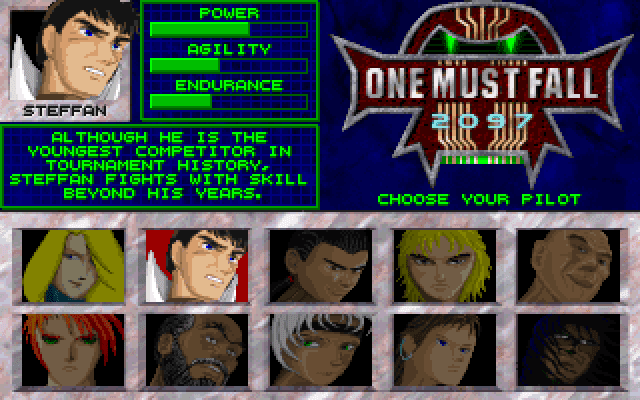 One Must Fall 2097 was one of the best fighting games for DOS. I would say this is as controversial an opinion as "Abraham Lincoln was one of the greatest Presidents of the United States." This is not saying too much, as most fighting games released for the PC before Street Fighter II have not aged well at all and most of the games released after Street Fighter II are ports of arcade machines of varying quality. Still, given the limitations of the controllers available to OMF, it still manages to be a game of surprising depth and yet easy to pick up and play today. The robots have varying abilities and while the balance is not necessarily perfect, all have their interesting points. Moreover, it is surprising today to learn that this game was realized mainly by four people (according to the credits). It is a testament to the talent and dedication of a few individuals who wanted to make a fun and enjoyable fighting game and succeeded tremendously. As for Rise of the Robots, virtually every negative comment I have heard about the game prior to my own investigation of it is justified. "Style over substance" and "graphics over gameplay" are two accusations that are entirely supported. Interestingly, RotR had over a dozen people working on it and a budget large enough to port it to eight very different platforms. It seems that whatever resources were left over after modeling the robots in 3D Studio Max was spent on ports. 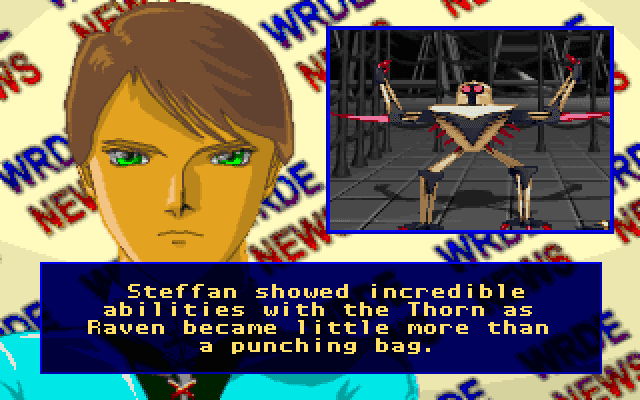 However, all those resources resulted in a game that was about as complex as the original Street Fighter arcade game. The moves are so simple, the too-few robots have very similar moves and there are only limited match ups available. The music, sound effects, animation and moves are too limited to keep anyone playing for long. Unless you are playing in the two player mode, your one robot will fight the same five robots in the same order over and over again until you get sick of the game. The game quickly becomes boring and between the awful control scheme and the cheap computer opponents there is no reason why I would want to play this game ever again after this blog entry. The PC version feels especially rushed, the console versions are more playable. Rise of the Robots deserves only to sit on a collector's shelf. When the first home computers came to market in the late 1970s, their capabilities were focused mainly on getting text to display on the screen. Text doesn't require color. Steve Wozniak wanted his second computer, the Apple II, to display in color. The computer had a monochrome text mode of 40 columns by 24 rows with a 7x8 character box. It also could display up to 16 solid colors (really 15 as the two gray colors are not really distinct) using those text boxes, and two colors in each box (a top color and a bottom color) for an effective resolution of 40x48. However, this Low Resolution Graphics Mode was insufficient for graphics of any real detail. 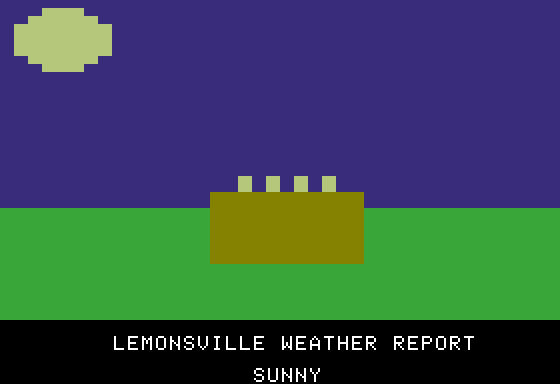 The Apple II also supported a 280x192 pixel High Resolution Graphics mode. The actual pixels were white and did not contain color/hue or saturation information. Each of bits, except the highest, of every memory byte for the HGR page could display a single dot if set (logical 1). A single memory location could set up to seven consecutive pixels. Pixels on even horizontal lines would appear as purple first, on odd lines they would be green first. If one pixel was set, it would be in color on a color monitor. If two adjacent pixels were set, they would appear as a double-wide white pixel. Similarly, if two adjacent pixels were off, they would appear as black. The trick to getting solid colors was to place pixels in an alternating on-off-on pattern. That is why people would frequently see "serrated" or "stripey" graphics with a monochrome display instead of a solid color. The effective color resolution is something close to 140x192. The trick behind color composite graphics is the use artifact color. The NTSC color carrier operates at a 3.58MHz frequency. The phase (measured in degrees, think of sine waves) of this frequency is shifted as the beam travels across the TV to set the color/hue, and the amplitude of the signal is varied to determine the saturation. In HGR Mode, the pixels, which constitute the brightness information, are being sent to the TV at a 7.16MHz frequency. Thus there are two "black and white" pixels for every "color" pixel. In a pure black and white mode, the color carrier, informing the TV that it is to display in black and white only. In fact, the Apple II has a "color killer" circuit to prevent the color carrier from being sent in full text modes. However, the text will show artifacts in mixed modes. With composite artifact color, the color carrier signal is sent. The phase of the signal oscillates from 180 degrees to 270 degrees, 0 degrees, 90 degrees and back to 180 degrees for each color clock. The pixels are sent at twice the frequency of the color clock, and depending on where on the screen the pixel is, this will show the combination of the two nearest phase shifts. Thus, in the original Apple II, you can obtain a green from the combination of 90 and 180 degrees (~135 degrees) and magenta from 270 and 0/360 degrees (~315 degrees). Soon, the designers of the Apple II figured out how to use the eighth bit of each memory location to delay the pixel clock by half a clock, giving blue (~45 degrees) and orange (~225 degrees) artifact colors. Visually, a memory location with blue/orange colors will appear slightly shifted compared to a memory location above or below with green/magenta colors. Due to the lack of bandwidth of an NTSC monitor, instead of getting colors alternating with black, you will see mostly solid colors. When the first pixel is set to color, the color carrier does not have time to fully transition back to black for the second color when the third pixel is also set to color. Thus you get a mostly solid color, however the better your monitor and connection, the more likely you will see lines between pixels. 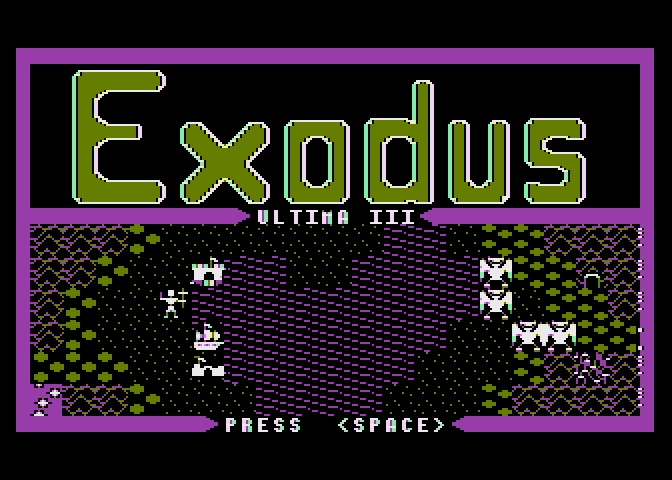 Later with the Apple IIe machines (after the first revision and expanded to 128K), a Double High Resolution Graphics Mode supporting all 15 unique colors was available. By this time Apple had begun to use VLSI chips and thus no longer as limited in the color selections. Double High Resolution Graphics use a 560x192 resolution and a 14.318MHz pixel clock. Because there are now four pixels changes for every color change, the effective color resolution is still close to 140x192. The extra pixels allow for a much more expanded color palette. The high-bit pixel clock delay of the High Resolution Mode, which was something of a hack, is not required. In this mode, each byte sets the color of two pixels. At least seventy games support DHGR graphics, but not all are very playable on a 1MHz 6502/65C02 and many of these games pale in comparison to versions of these games for other platforms. Maniac Mansion, Sierra AGI Quest games and many arcade ports fall into this category. Still, there are several games originally developed for the Apple IIe and its DHGR mode, including Prince of Persia (limited), Dragon Wars, Might and Magic II, King's Bounty, Air Heart, Into the Eagle's Nest, Legend of Blacksilver. While the Apple II was built entirely with generic TTL logic chips, the Atari 8-bit machines had a pair custom graphics chips, ANTIC and CTIA, later GTIA, to handle the graphics modes. ANTIC and GTIA offered several graphics modes, and one of them, ANTIC Mode F, BASIC Mode 8, gave a 320x192 resolution mode with monochrome graphics. However, this mode utilized artifact color. Many ports of Apple II games used this mode. Four primary artifact colors are supported in this mode, the colors vary depending on the revision of the CTIA or GTIA chip and system. At least 45 games support the Atari composite color mode, including all the Ultima games, anything released by Origin Systems, Broderbund's original Choplifter, Lode Runner & Championship Lode Runner; Sierra's Hi-Res Adventures, Flight Simulator II and many Pinball games. 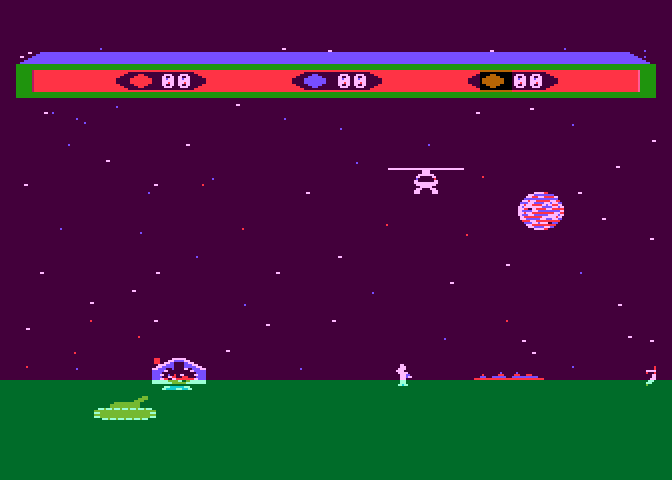 Unlike the Apple II, the Atari machines were not strictly limited to black and white as the direct color in this mode, as can be seen in Choplifter and Ulysses and the Golden Fleece. These machines can set artifact color in combination with a direct color. Assuming that the base color is white, the usual artifact colors are blue (~0 degrees) and brown (~180 degrees). Some machines reverse the colors output. Atari 8-bit Composite Color Example #2 - Choplifter! In 1982, Tandy released its Color Computer. Its graphics system had definite similarities with the CGA card, its sound system was very simple and it was not very attractive to game developers. It supported a 256x192 artifact color mode, with blue and orange in addition to black and white. Many games used this mode due to the limitations of the direct color modes. 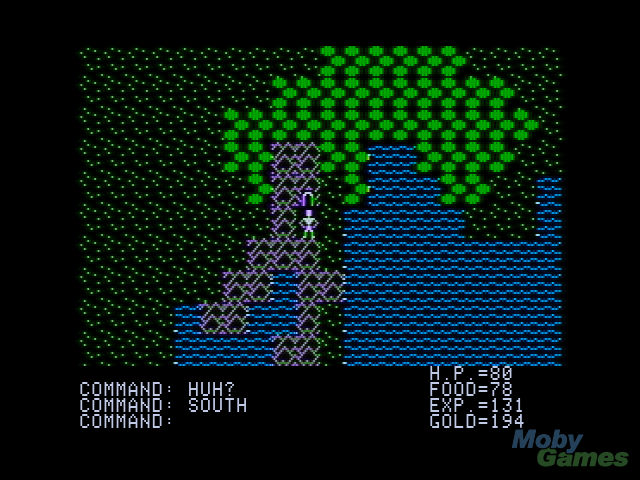 Essentially the graphics look very similar to the Apple II's HGR graphics, but are more limited due to the absence of any primary colors other than blue and orange. The Color Computer 3 has far superior graphic capabilities, enough so that a nearly-perfect port of Donkey Kong was created for it. Artifact color does not work with S-Video (which can be obtained from the Atari 800), as that connector separates the luminance and chrominance signals. Artifact color relies on the demodulation of the combined luminance and chrominance signals. You will see monochrome colored pixels with serrated graphics where color was intended if you use S-Video. Artifact color was designed for NTSC-standard monitors. No PAL home computer ever used it. The Apple II Europlus does not output color without a special "PAL color card." The Apple IIe and later models have the PAL color card built in. The video output is not as good as with an NTSC monitor. 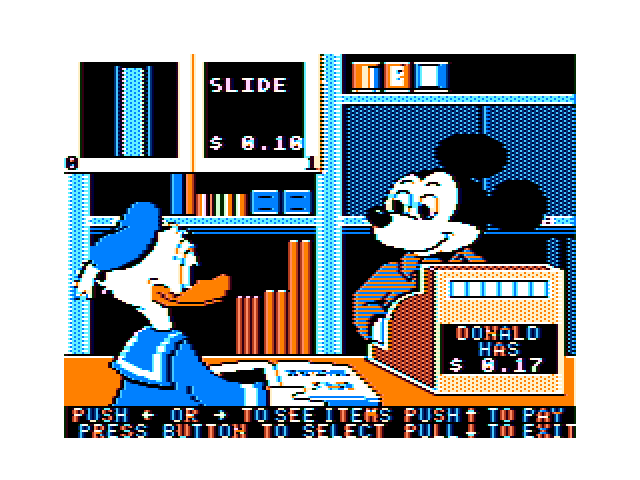 There is no "PAL" CGA card. The PAL Atari 8-bit machines would have treated the 320x192 as a strictly monochrome mode. While the TRS-80 CoCo may not have been widely distributed in Europe, the Dragon 32/64 computers are very close cousins to it. While it supports a 256x192 mode, it seems to be strictly black and white. Compare the game "The Vortex Factor" for both systems. Continuing in my series profiling various flash cart devices, I turn to that incredible device known as the Everdrive 64. This cartridge loads N64 ROMs off an SD card and lets you run just about every Nintendo 64 game on the Nintendo 64 game console as they were meant to be run. No need for emulators of varying quality. No need to hunt down expensive cartridges. Making an all-encompassing Nintendo 64 flash cartridge is not an easy task. Krikzz, a developer from the Ukraine, decided to make a cartridge that would eventually work with any game regardless of saving mechanism or lockout chip. Thus the Everdrive 64 was born. The Everdrive 64 has just been released with v3. v1 does not support games using Flash RAM saving (Jet Force Gemini, Legend of Zelda : Majora's Mask, Megaman 64) without a firmware upgrade via a special programmer. The v2 can update the firmware without needing a special programmer and loads faster, but the last firmware update was in 2011. v2 is what I have and is identical, feature-wise to the current v2.5 version still being sold. The SD card must be formatted in the FAT16 or FAT32 formats. SDHC cards are supported, so you can easily put a 32GB SD card in the Everdrive 64 formatted with FAT32 in Windows 2000, XP, Vista, 7 & 8. A folder called ED64 must be created in the root of the drive and the current OS file, OS64.v64, must be placed in it. That is all that is required for the card to work. An 8GB card should be sufficient to hold all the ROMs you would want to play. Official Nintendo 64 ROMs need a CIC chip installed in the Everdrive 64 to work at all. The most common CIC chip, by far, was the CIC-6102/7101. A working CIC-6102 (NTSC models) or 7101 (PAL models) must be desoldered from a Nintendo 64 Game Pak and put in the socket inside the Everdrive 64. The Everdrive 64 can now use the 6102 or 7101 to emulate all the other CIC chips, including the more advanced CIC-6105 chip. Of course, to play all Nintendo 64 games (except as noted in the last paragraph), you will need the right peripherals. This means you may need up to four Nintendo 64 Controllers, a Controller Pak for games that do not save to the cartridge (the Castlevania games for example), a Rumble Pak is recommended for games that support that feature (the Zelda games, Star Fox), the Expansion Pak to add more RAM to the system (Donkey Kong 64, Perfect Dark, Legend of Zelda : Majora's Mask, Banjo-Tooie), the Transfer Pak for the Pokemon Stadium games, and the VRU Voice Recognition Unit for Hey You, Pikachu!. The Everdrive 64 will sort ROMs alphabetically and create save files automatically as a game would have saved its game to a cartridge. However, you must press reset before turning the system off or the save will be lost! v3 has a battery, so this will no longer be an issue. The cartridge now supports Gameshark codes, but will not emulate a Controller Pak or support save states. However, with the most recent OS it can switch Controller Pak save files in and out of the Pak. I ordered my Everdrive 64 directly from Krikzz. He had options to add a cartridge shell with a nicely cut slot for the SD card and a CIC-6102. I highly recommend this cart, especially the new v3 version with a real time clock (Animal Crossing) and its socketed battery which eliminates the need to press reset to save a game.